Every employer must provide their workforce with a workplace pension. Almost all employers will have gone through auto-enrolment, therefore employers are now starting to go through re-enrolment which happens every three years. The final part of this process is one of the most important (to avoid hefty fines from the pension regulator) and this is your re-declaration of compliance. To comply with your pension duties, you must complete your re-declaration of compliance within 5 months of your staging date. Hopefully you will remember doing your declaration of compliance first time round, and this process is very much the same for re-enrolment. 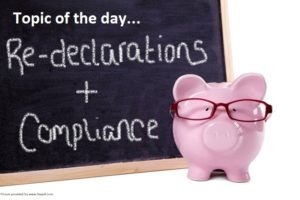 Your re-declaration of compliance must be completed within 5 months of your auto enrolment staging date and not the re-enrolment date you have chosen. Your declaration of compliance must be completed and resubmitted even if you are not re-enrolling any employees. You can complete your declaration of compliance by visiting the Pension Regulators website. Don’t miss your deadline! Failing to meet the deadline for your re-declaration of compliance may lead to fines and penalties from the pension regulator!